Are you looking for a few more Halloween Activities for the kids. You might want to try one or more of these fun, inexpensive activities pictured below. Just click on the link below that matches with the above picture for directions. ALSO, to celebrate this FUN, Spooktacular Time of Year, along with some other sellers on Teachers pay Teachers, I'm having a sale in my TpT store on the 31st! Head over to grab yourself a Spooktacular Discount! Everything is at least 20% off! I will set up my store to begin the Sale on the 30th and continue into the 31st! Also, here's a LINK to our Hostess JD's Rockin' Readers and lots of other stores that are having a Spooktacular SALE! Have a WONDERFUL SPOOKTACULAR HALLOWEEN!!! 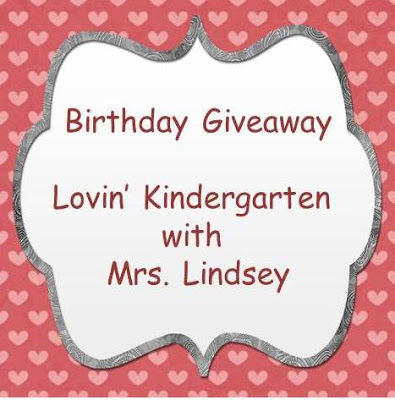 Lindsey at Lovin' Kindergarten with Mrs. Lindsey is having a GIANT Birthday GIVEAWAY! You can win educational products from 30 different bloggers!!! I have donated my DOLCH SIGHT WORD BINGO GAME which has a CAT THEME! There are many other fabulous products also! Click on the DOLCH BINGO GAME picture above to learn more about my product. Click on the top picture to see all the other products that you can win and to ENTER LINDSEY's GIVEAWAY! Good Luck! I hope you WIN many, many AWESOME Teaching Products! WOW, this is a great week to enter lots of GIVEAWAYS and WIN lots of GREAT PRODUCTS! Erin from Tales from Room112 is having a GREAT GIVEAWAY! You can win over 50 Fabulous Products!!! I have donated my 2D Shapes Word Wall and Student Activity Cards. 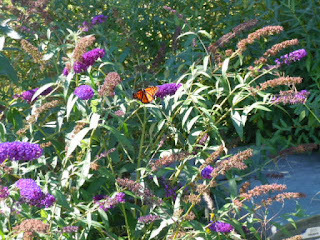 There are lots, and lots, and lots of other fabulous products also! Click on the 2D Shapes picture above to learn more about my product. Click on the top picture to see all the other products that you can win and to ENTER ERIN's GIVEAWAY! Good Luck! Win LOTS of GREAT Teaching Products! Hillary at Rockin' Teacher Materials is having an AWESOME GIVEAWAY! You could score $170 worth of Rockin' Materials to use with your students! My donation to the giveaway is my SPIDER ADDITION PLUS 1 Matching Activity/Game! Just click on the Spider Addition Game picture above to learn more about my activity! Click on the top picture to go directly to the GIVEAWAY! I hope you WIN lots of great teaching materials! Corinna at O "Fish" Ally a First Grader is having a huge GIVEAWAY! There are over 50 digital products worth over $200! Corinna has broken the GIVEAWAY down into 4 different Rafflecopters. You can enter 1, 2, 3, or all 4 Contests! My donation is in the 1st Rafflecopter with the other PRE-K PRODUCTS. 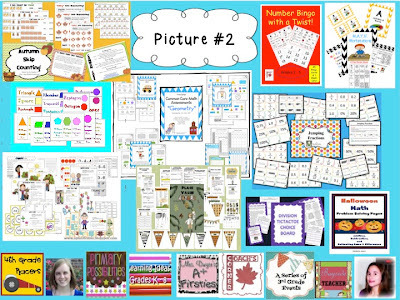 It is my NUMBER POSTERS 0-10 with TEN-FRAMES suitable for grades Pre-K, K, and 1. The other 3 rafflecopters are for older grades. Click on the Numbers 0-10 Posters with Ten-Frames above to learn more about my product. Click on the top picture to go to Corinna's blog to enter the GIVEAWAY!!! GOOD LUCK!!! I hope you win LOTS of awesome educational resources!!!! I love combining children's excitement about the holidays with an educational lesson. I think its a WIN, WIN for the kids and teachers. 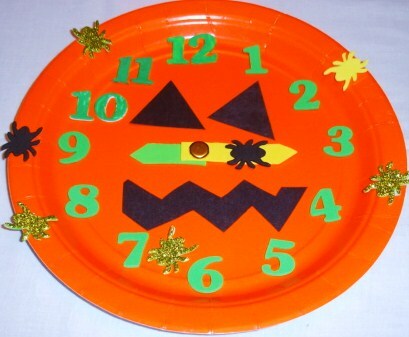 Last week, I posted a couple of inexpensive Halloween Pumpkin Clocks for the kids to make with paper plates. You can read those posts here and here. Here are two more! 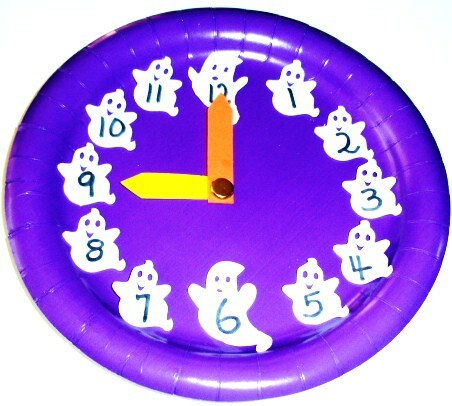 How about a Friendly Ghost Clock or a Spider Clock? 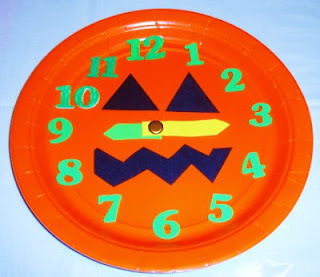 If you need directions, you can hop over to last week's directions for the pumpkin clock. You can find the directions here. 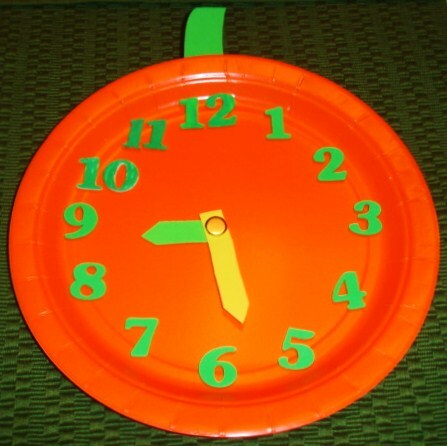 A trip to a Craft Store or even a Dollar Store can give you more choices for a Halloween Clock Theme. I think the Turkey stickers are available also if you want to start early and tie in Thanksgiving and a Math Lesson on Time. If you want more ideas for using the Friendly Ghosts Theme with younger kids, you can get some great Montessori Ideas in a post by Deb Chitwood from Living Montessori Now. Just click on the link below. If you want some more ideas for incorporating Spiders into your teaching lessons, you can read one of my posts by clicking the link below. You can also visit my Pinterest Page about Spiders and Arachnids for more ideas. Have a great holiday season with the kids! With the new Autumn Season, children have Halloween on their minds long before the BIG DAY! This craft project is a way to talk about the holiday, make a simple Halloween craft, and sneak in some math. My last post gave directions for making a Pumpkin or Jack-O'-Lantern Clock with an orange paper plate. You can read that post here. 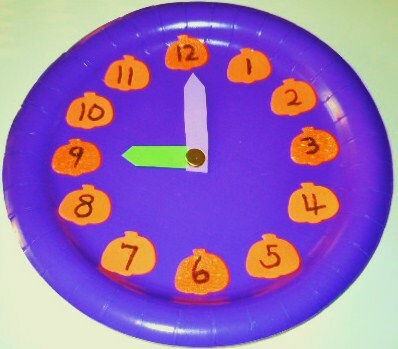 Today's post shows another inexpensive Pumpkin Paper Plate Analog Clock that kids can make with adult supervision using pumpkin stickers. Paint the front of the plate (optional). Stick 12 pumpkins stickers on the plate in the appropriate spots for the numbers. Draw and cut 2 "hands" for the clock. Carefully push the fastener through the hands then through the middle of the plate. 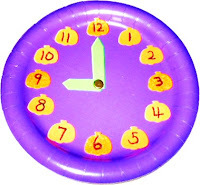 This clock can be used when learning to tell time or for lessons on elapsed time. 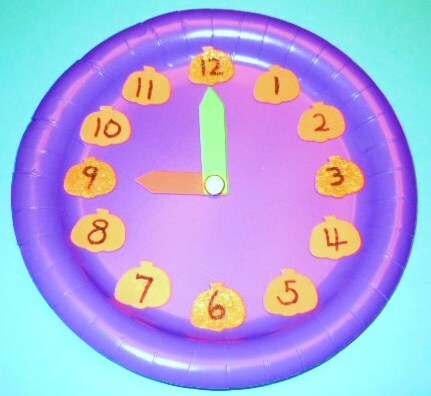 For children having difficulty with the hour and minute hand, it might be helpful to use different colors for the hands. 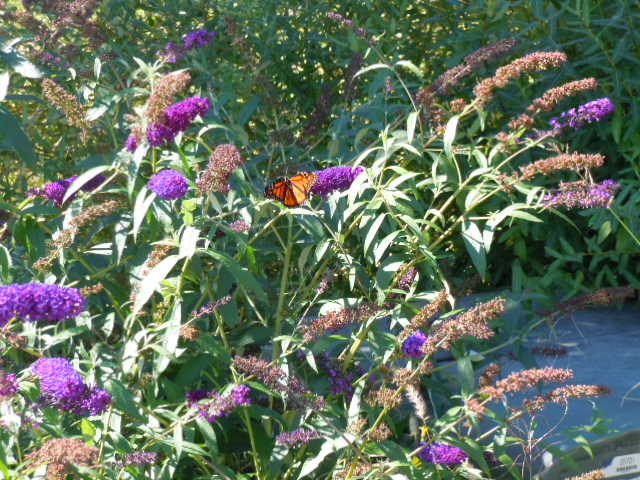 Here's an autumn nature picture with the same colors: purple, orange, and green! Hope the kids have a great TIME making their clocks! Students can have fun making these Pumpkin and Jack-O'-Lantern ANALOG CLOCKS when they are learning to TELL TIME and also when they are learning about ELAPSED TIME. If the paper plate is white, paint it orange and let it dry. Place the number stickers around the edges of the plate in the appropriate positions. Draw and cut 2 heavy paper or foam hands for the clock. 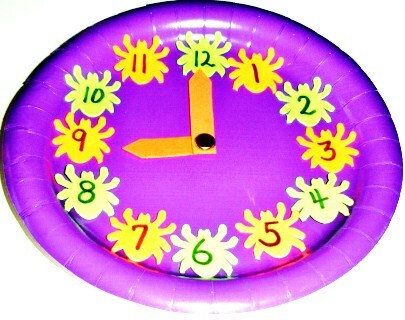 Carefully insert a paper fastener through the clock hands then through the center of the paper plate. Draw and cut a green stem and glue it to the top of the plate. 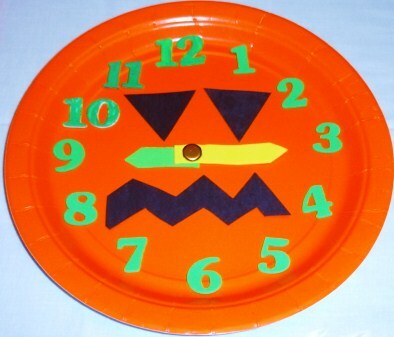 To make the jack-o'-lantern clock, draw and cut 2 eyes and a mouth from black construction paper. Glue these pieces on the plate. Perhaps the kids might like to put some spiders on their clocks They could use some scary spider stickers!!! EEK!! 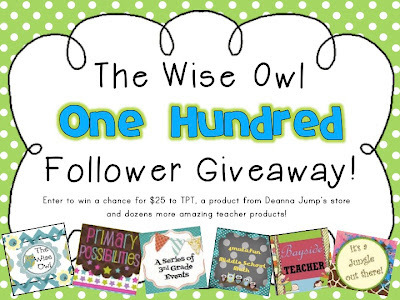 Kate from The Wise Owl is having not 1, not 2, but 3 One Hundred Follower GIVEAWAYS! You can enter all 3 awesome giveaways!!! Here are some pictures of the blogs participating and the many, many, products that you can Win, Win, Win!!! My product is in GIVEAWAY #2. Click on the 2D SHAPES Word Wall Cards above to learn more about my product. Click on any of the top 4 pictures to go to Kate's blog to enter the GIVEAWAY!!! 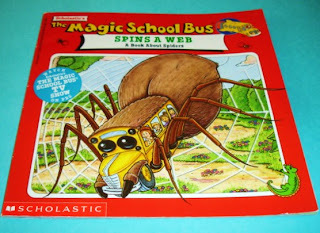 October is the perfect month to combine reading and science by reading a book about SPIDERS with children. A good choice would be The Magic School Bus Spins A Web written by Joanne Cole and Bruce Degan. Many children are familiar with Ms Frizzle and the other characters in this series of books by Scholastic. With this book, the students will learn lots of interesting facts and some great vocabulary about spiders such as the fact that spiders are not insects! Spiders are arachnids! Spiders have 8 legs. 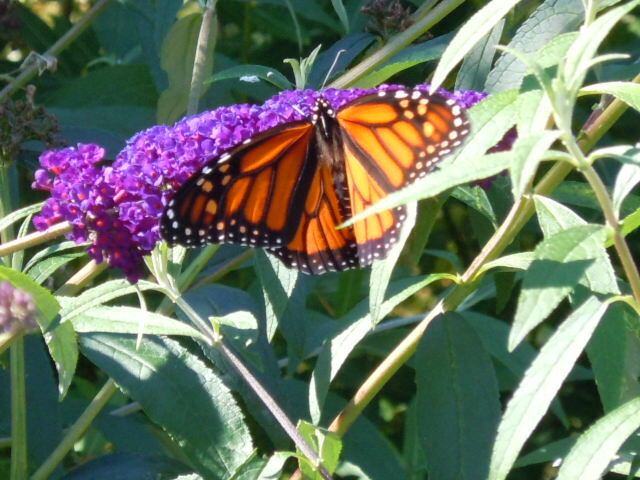 Insects have only 6 legs. Also according to scientists (and Dorothy Ann) you are never more than 3 feet away from a spider! EEK! The authors explain that there are more than 100,000 kinds of spiders but focus the emphasis of this book on 3 particular kinds of spiders. They explain how these spiders spin their webs and attract their prey plus lots of other interesting facts while Miss Frizzle and her students have another wild adventure! After reading the book, the kids might also like to view the video. Have fun learning about spiders and enjoy this creepy Halloween season! Students match-up 2 small words and build a compound word. 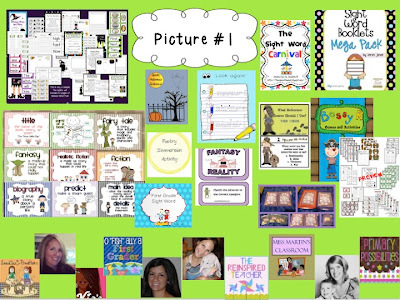 You can download this FREE pdf file from my Teachers Pay Teachers (TpT) store. Just click on the link below. TpT Buyer accounts are FREE to open and you can then download thousands of FREE and PAID products. You can also download the file from my website (Learning Workroom). 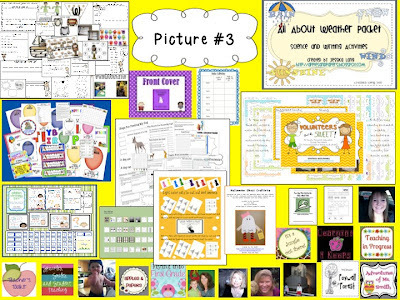 Just click on the link below and go to FREE Worksheets. Have fun with compound words! 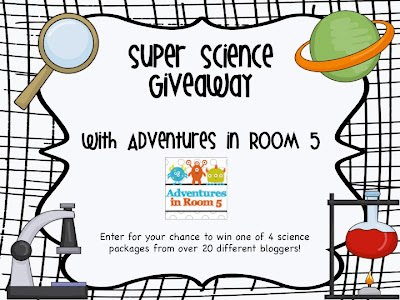 Cassandra from Adventures in Room 5 is having a wonderful SUPER SCIENCE GIVEAWAY! You can enter to win one of 4 great science packages from over 20 different bloggers, so be sure to hop on over and ENTER!!! I have donated any one science product of your choice from my Teachers Pay Teachers (TpT) Store but there are also over 20 other teaching resources to win so click the picture above to hop on over to Cassandra's blog to see ALL the products and enter 1 or all 4 of the giveaways. Here is a brief sampling of some of the science products you can win from my TpT store. Good Luck .... I hope you win lots of products that can help your students have fun learning science!